‘Eendragt Maakt Magt’ (Unity Makes Strength) was a response to two crises in 1763 and 1772-1773, which occurred in rapid succession. 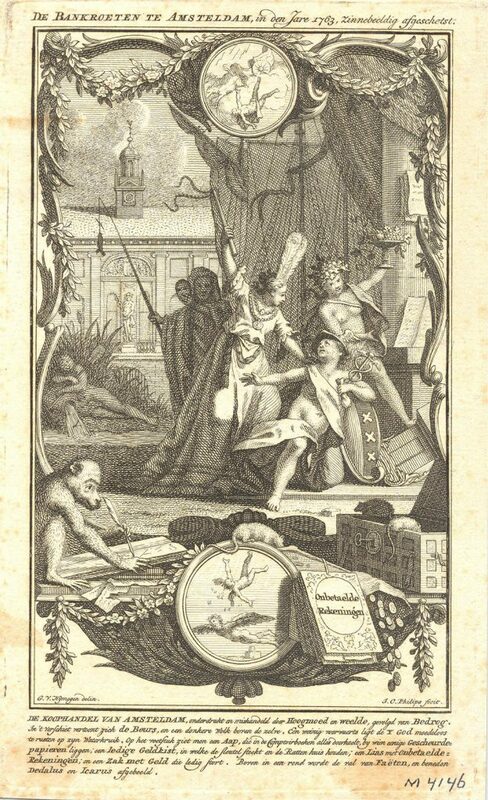 This cartoon refers to the many bankruptcies that resulted from the 1763 crisis in Amsterdam. Partly because of the restriction on trade during the French period (1795-1813), ‘Eendragt Maakt Magt’ (Unity Makes Strength) did not become a success. It was only after the stock exchange crash of 1929 - with the foundation of Robeco - that the interest in investment funds revived. 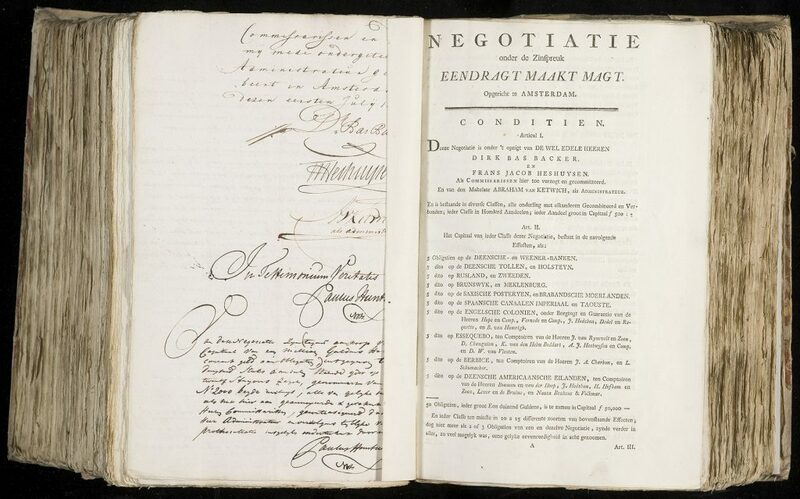 The deed of incorporation of ‘Eendragt Maakt Magt’ (Unity Makes Strength) from 1774. It is clearly visible that the first investment fund spread the risks and concentrated on foreign bonds. The economic situation did not look bright in the second half of the 18th century. In Great Britain, the Ayr bank went bankrupt, and Dutch bank Clifford & Co was pulled into this bankruptcy. This resulted in a crisis that continued to spread like wildfire in 1772. As it is often the case, setbacks led to reconsideration and innovation. Amsterdam-based realtor and merchant Abraham van Ketwich founded the first investment fund in the world and called it ‘Eendragt Maakt Magt’ (‘unity makes strength’). The idea was to reduce the risk for individual investors by distribution across different funds. Apparently, at that time, the offer of securities in the Netherlands was broad enough to establish an investment fund. Because many investors had their fill of shares, ‘Eendragt Maakt Magt’ focused on bonds. The fund consisted of several ‘classes.’ Every class represented one hundred freely transferrable bearer participation certificates with a nominal value of 500 guilders. This concerned foreign bonds. Although Dutch bonds posed a reduced risk, they did not provide enough return. Abraham van Ketwich let two commissioners manage the fund. He only did the administration. With this separation of powers, Van Ketwich prevented a conflict of interest. The fund was not successful, partly due to the Fourth Anglo-Dutch War and political upheavals in Europe. Liquidation followed in 1824. The 1929 stock market crash brought about a revival of the interest in spreading risks and, consequently, investment funds. 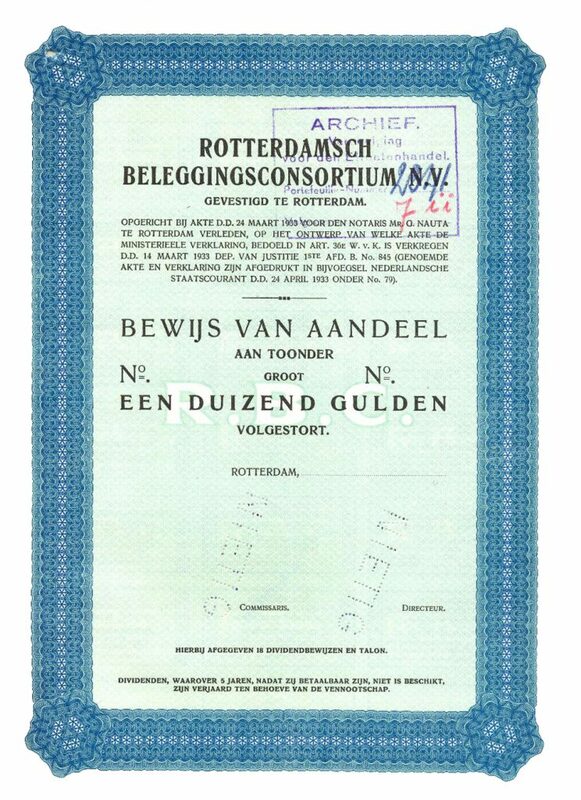 In December 1929, a few harbor barons founded the Rotterdams Beleggers Consortium (Rotterdam Investors Consortium), which has been operating as an investment fund under the name Robeco to this day.